One of the highlights of my Labor Day weekend trip to Phoenix (other than quality time with friends, family, and a beautiful wedding) was being taken on a veritable culinary tour of the city by my way-cooler-than-your-uncle Uncle Jason. This is the first restaurant review I've ever done, but I'm reading through Ruth Reichl's books right now so I feel inspired! First stop on the tour, Liberty Market. I am madly in love with this place, and spent most of the meal scheming to convince Andy that we should pack up our lives immediately and move somewhere within driving distance. 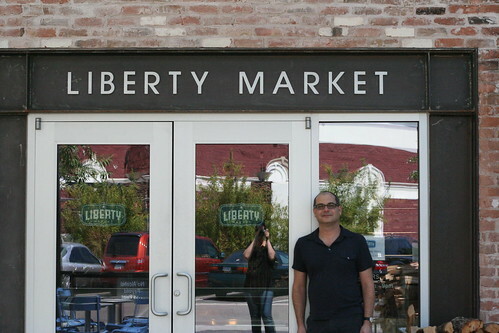 Liberty Market is a salad/sandwich/pizza/coffee/bakery-type cafe. But it's so much more than that too. The entire staff was so genuinely friendly, especially the lovely hostess/barista (didn't catch her name) who kindly treated me to espresso and a souvenir lip balm. There's a little gourmet marketplace, the art in the bathrooms is ridiculously awesome, there are some grand communal tables, and (per Uncle Jason) the produce is grown locally (like, a couple of miles away) on a farm owned by the one of the owners of the restaurant. We had a feast fit for a royalty. An Antipasto Platter, a simple Farmer's Salad (with a lemon vinaigrette that I plan on trying to recreate. 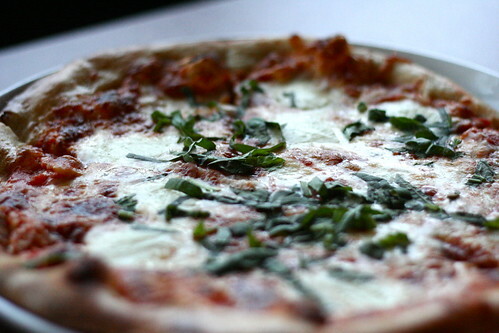 Too good for words), and a Margherita Pizza. 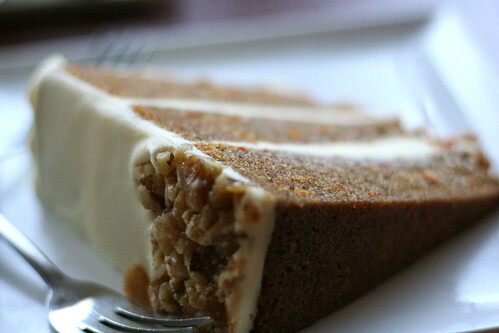 For dessert, Jason's favorite: Carrot Cake. 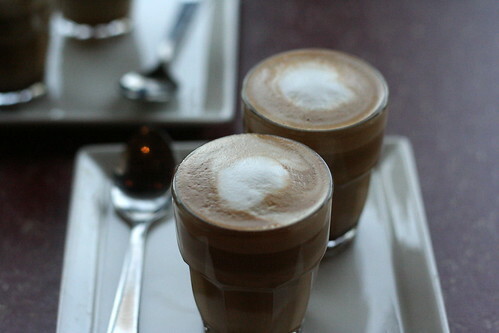 And Cuban micro-lattes called Cortaditos. Never had anything quite like it, and it was a sublimely perfect way to top off the meal. 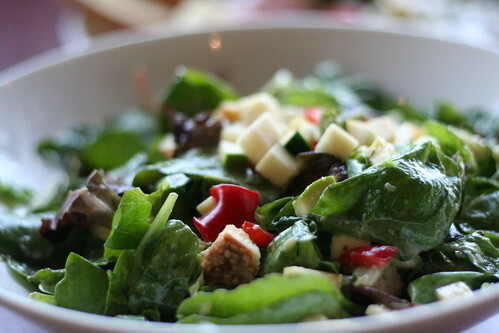 Simple, delicious food. Hands down the best meal I've had in recent memory, and I'm already looking for excuses to return. The next day, we gathered up our friends and family and headed to Sweet Republic. 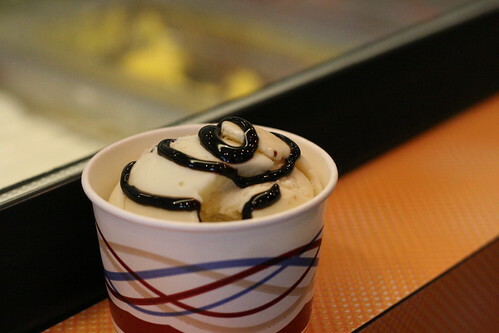 This nationally-acclaimed artisan ice cream shop is owned by Jason's sweet friends Helen and Jan. I'd been hearing about this place for what feels like years, and it totally lived up to the hype. The selection of flavors was just the right balance of classic and off-the-wall innovative. My endearingly old-school grandparents went for vanilla and espresso. Andy had Cheese Course Duo, a blue cheese and date-flavored ice cream with balsamic glaze, and I had a scoop each of Key Lime Pie (my fave) and Peanut Butter Chocolate. 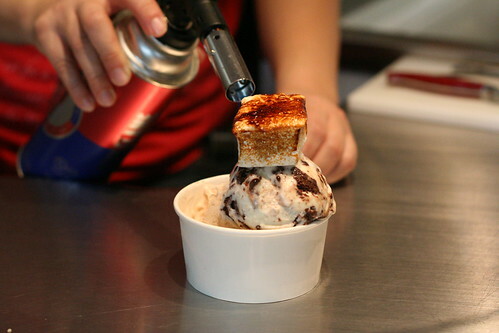 Jan whipped out a blowtorch and roasted a house-made marshmallow right on top of my ice cream. How awesome is that? They also had a flavor called I Love Bacon... toffee-covered bacon in caramel ice cream, for you pork lovers out there. 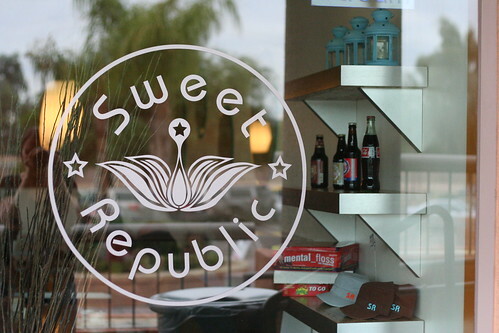 If you ever find yourself in the Phoenix area, please stop by Sweet Republic, I promise you'll love it. Their website says that their goal is to put a smile on each customer's face. To me, that says it all. Mission accomplished! Amy - both places sound great! My husband and I are planning a trip to Tempe in mid-Oct to visit our friends, so I will add these to the list of places we want to go while there. Thanks for the tips (as well as the mouthwatering pictures!). Love Sweet Republic! I had the good fortune to visit in July. Best ice cream ever! Yum. If I ever make that way I'll keep it in mind! YAY... I'm so glad you are enjoying the books! sounds like you had an absolutely delightful experience, in so many ways! i, too, think SWEET REPUBLIC is THE BEST~~EVER!!! This looks like a great food find! 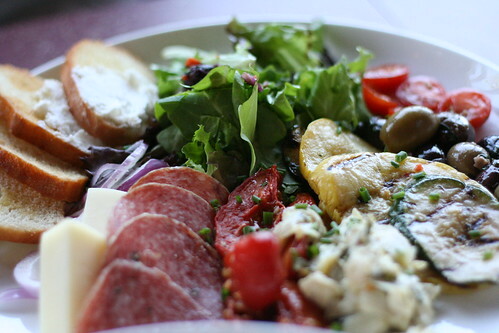 The antipasto platter looks amazing, definitely something I would order. And that marshmallow topped sundae reminds me of the Simpson movie where the neighbor offers Bart some hot cocoa... with whipped cream, chocolate shavings and a toasted marshmallow on top - lol!